"An abundance of art, food and nature make the Berkshires an idyllic (and interesting) country escape.." writes Natalie Shukur in the month's Australian Vogue magazine. She curates a pictorially lush travelogue of accomodations, restaurants and art venues including the Frelinghuysen Morris House & Studio. Read the whole article right here! This matching grant will help pay for the completion of the repair to the four rear patios and has been a catalyst to continue and expand engineering probes. A probe last month uncovered steel beams in a critical area eliminating mysteries for the engineer's calculations. We look forward to final approval at the Town Meeting in May. Thank you committee members and Land Use Director/Town Planner Gwen Miller. 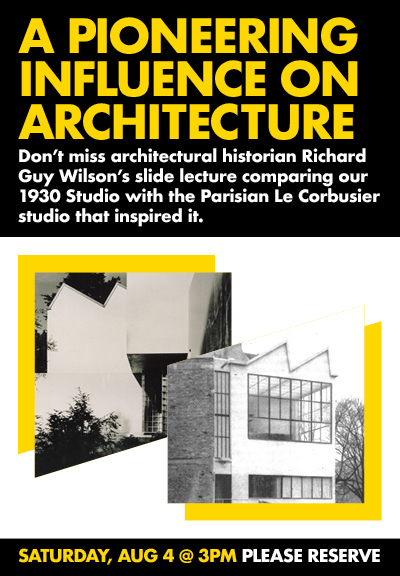 Click here to enjoy the slide lecture by University of Virginia Architecture Department Chair Richard Guy Wilson as he describes the origins of the Le Corbusier-inspired Morris Studio, built in 1931 in Lenox, Massachusetts. 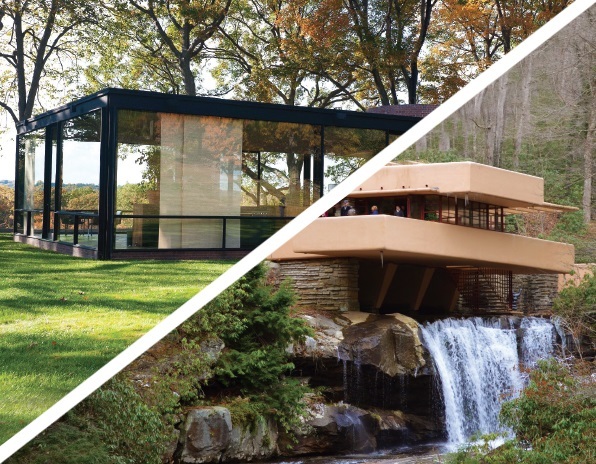 The 38 minute video of the lecture this past season is full of information detailing the rise of Modern architecture in Europe and America. 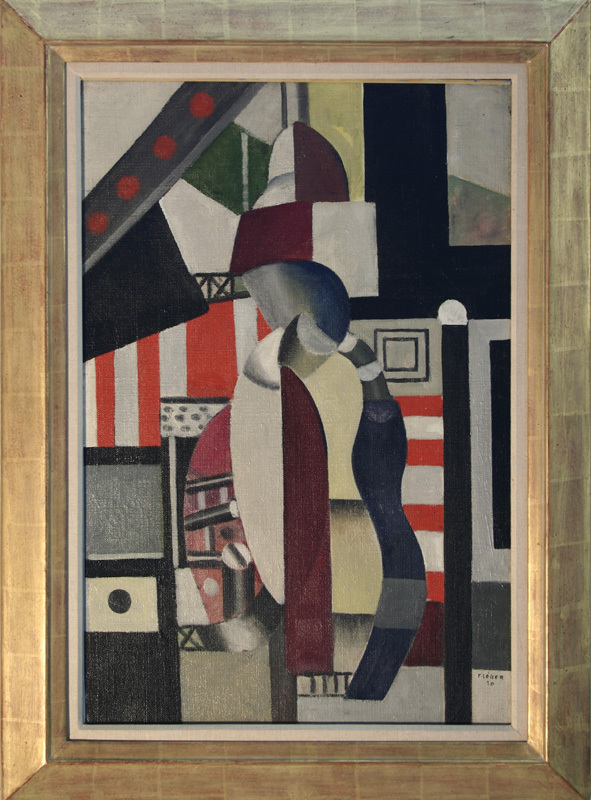 Frelinghuysen's painting sold for over three times its high estimate and far surpassed her previous auction record of $85,000. 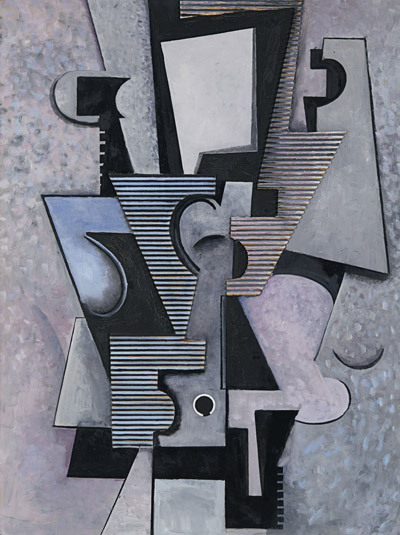 "Composition" measures 40"x30" and was painted in 1943, incorporating corregated cardboard as a collage element. 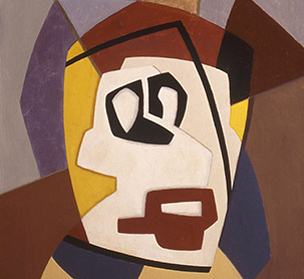 Appearing wholly abstract at first, it actually refers to the image of a bullfighter. 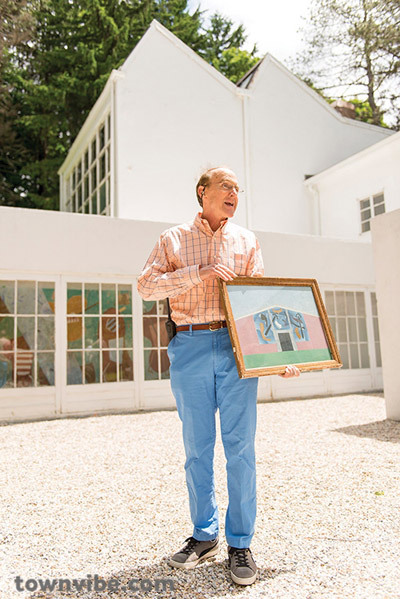 Renowned collector and travel entrepreneur Barney A. Ebsworth bought the painting in the 1970's adding to his collection based on the rise of American Art in the 20th century. 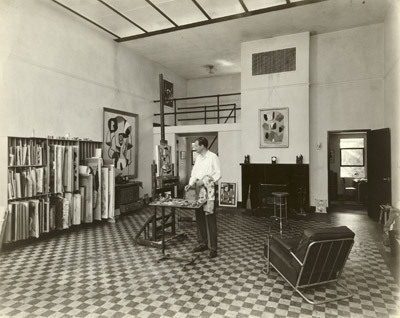 He exhibited his collection widely across the United States. Director Kinney Frelinghuysen will present at NEMA's 100th anniversary conference this November 7th. 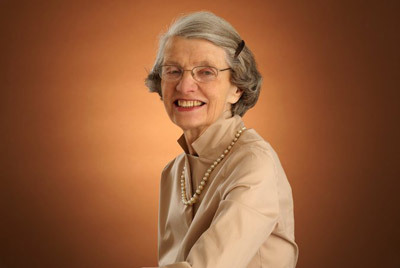 He will present a slide show on the session: The Women Behind Historic Artists' Homes and Studios of New England. 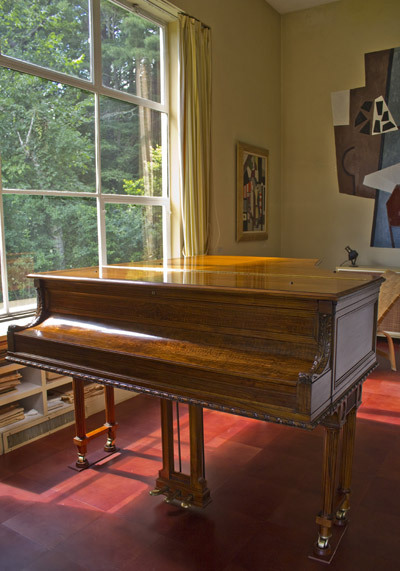 Using archival photographs, letters, telegrams and other documents, he will illuminate Suzy's dual careers as painter and opera singer and her work to preserve the House & Studio and Collection. 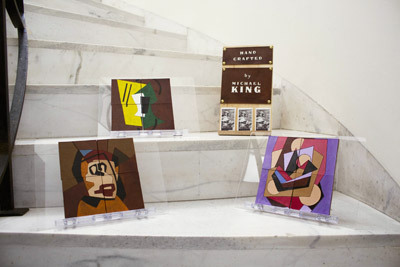 Keely Orgeman, curator at Yale University Art Gallery will discusss "The Ever-Evolving Abstract Language of George L.K. 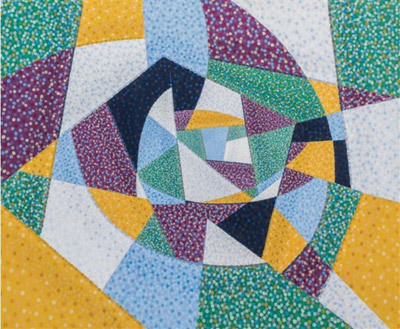 Morris" this Sunday, November 11th @ 2pm at the American Art Fair. The Fair is celebrating its 11th year and is held at the Bohemian National Hall, 321 E 73 Street, New York, NY. It opens American Art week in New York and displays 17 exhibitors. Admission is complimentary and seating for lectures are on a first come basis. Closed for the Season. Groups of 12 or more by advance appointment until October 31. Thank you, members and visitors,for making it the best, most inspiring season ever. 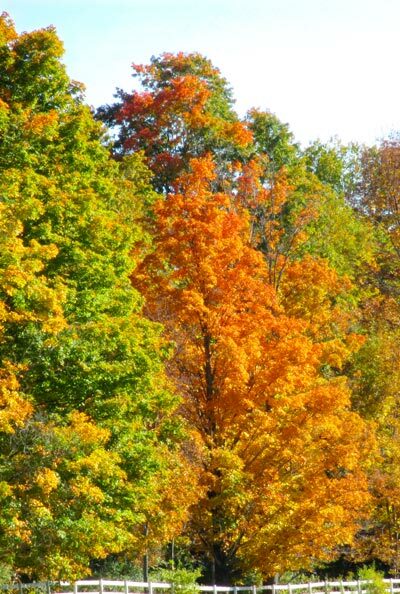 Please come back next spring! Click here to listen to his interview with Joe Donohue. 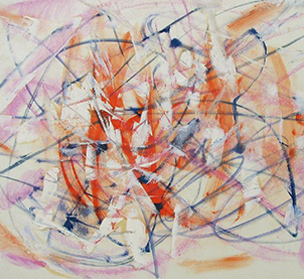 "When Frelinghuysen Morris House & Studio opened its doors to the public in July 1998, the crowds of people lining up to view the home of abstract artists George L.K. Morris and Suzy Frelinghuysen was greater than imagined." writes Jennifer Huberdeau of the Berkshire Eagle. "The New York Times had done a piece just days before. People in line were clutching the article in their hands," said Linda Frelinghuysen of that first day nearly 20 years ago. "We were prepared to take 10 people at a time on the tour, we had 16yr olds selling tickets and taking cash in the parking lot." "We were wondering if anyone would come out, "director Kinney Frelinghuysen reminisced. Click here for the full article. 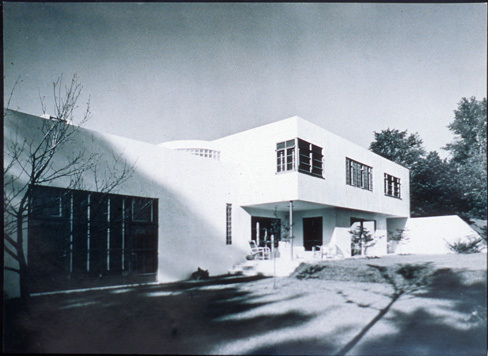 FMH&S was awarded a $19,185 matching grant from the Lenox Community Preservation Fund to repair and restore a major structural issue of the 1941 stucco modern house. Water damage at the base of the dining room sliders resulted in a structural failure from the bedroom above the dining room. The dining room's steel doors and marble base will be restored and repaired. 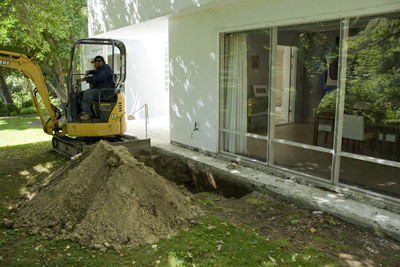 Work on the project begins immediately. Spring is here! 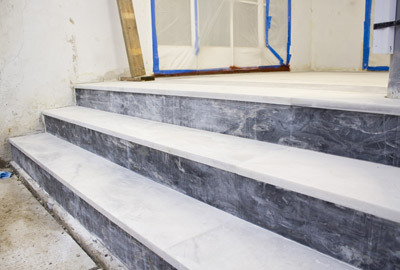 The marble back patio and steps almost finished! 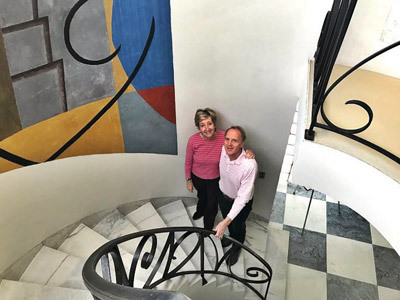 "Across the Berkshires, historic homes are emerging from hibernation...At the Frelinghuysen Morris House & Studio, cold air, large expanses of glass and moisture combine as threats to art," writes Ruth Bass, Berkshire Eagle columnist and author of this feature in their Up Country magazine. Click here to read the whole article about all the homes, starting on page 63. 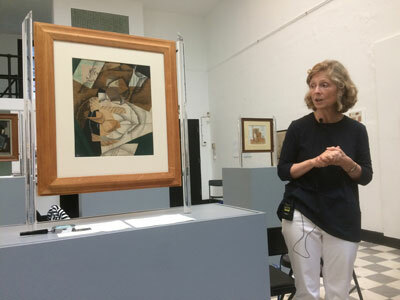 You didn't miss the "Shades of Gris" lecture last July--Click below to watch! 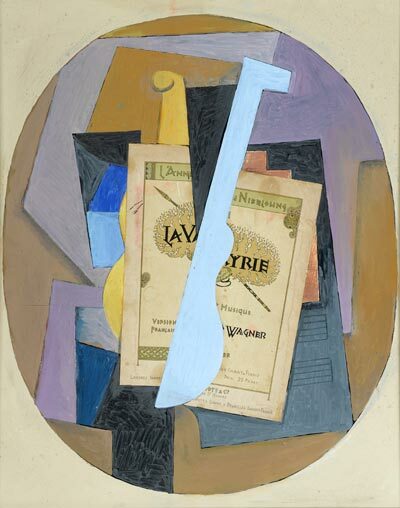 View an informative and entertaining lecture by Emily Braun, curator of the Leonard Lauder Cubist Collection at the Metropolitan Museum in New York and Professor at Hunter College and the Graduate Center--Cuny. 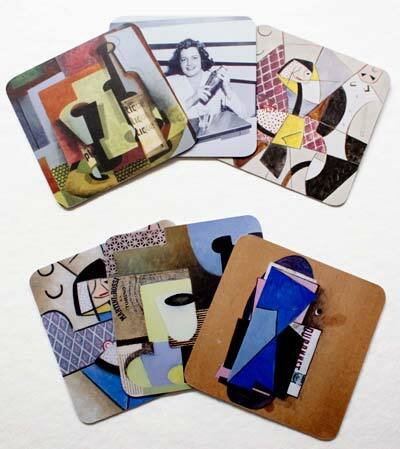 She reveals the stories the historic labels on the backs of paintings tell us and examines the hidden imagery by Cubist Master Juan Gris. Click here to view. You didn't miss the films---Click below to watch! View the videos from the final digitizing of the 16mm 1930's travel films by artist George L.K. Morris. 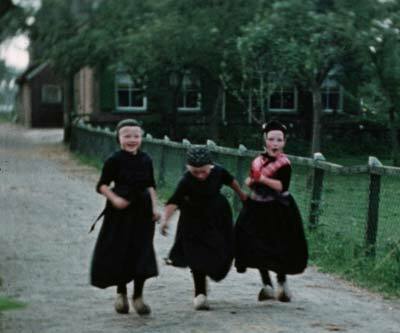 Never before seen footage of South and Central America, the Netherlands and France in color. Click here to see the silent films. The circa 1905 claro walnut Knabe has been completely refinished and restored and is back in the Living Room on the new leather floor. Click here to hear musician Dave Wright from Concord, Massachusetts test out the new action! 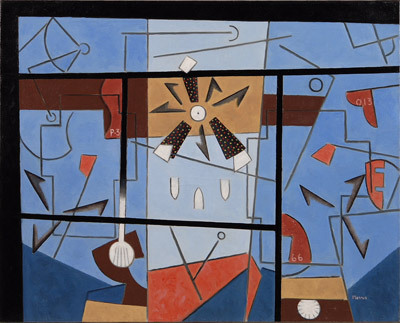 Indian Composition, 1938, a large oil painting by George L.K. Morris, is now on view in the Metropolitan Museum's newly configured Modern and Contemporary Art Gallery. It is hanging in Gallery 913 after its conservation. 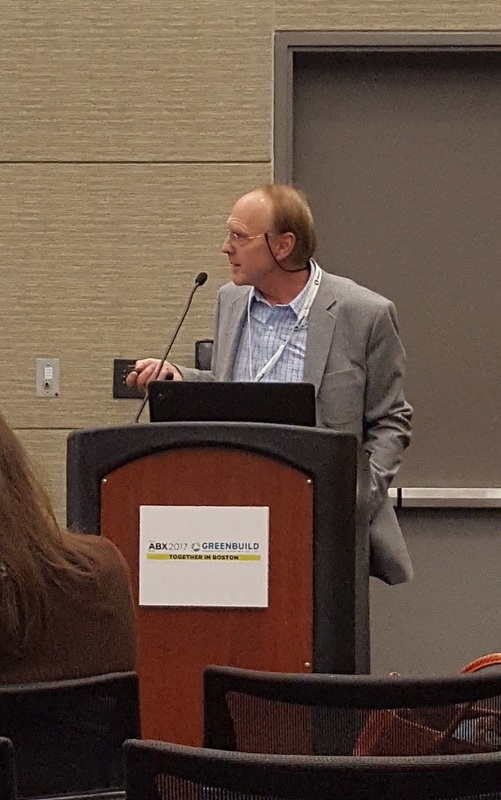 Director Kinney Frelinghuysen presented at the massive Architecture Boston Expo (ABX) last week on the Future of the Modern Past at Landmark Houses, one of three case studies. Our mission finds strength in numbers! "Finding the right person to install your new tile floor can be difficult. Finding the right person to install your new leather floor? Nearly impossible. It was just one of the many challenged faced by Kinney Frelinghuysen, director of the Frelinghuysen Morris House & Studio, when the museum's trustees decided it was time to replace the leather living room floor" writes Jennifer Huberdeau.Read the full article here.--and her companion article here describing the gifts made from repurposed leather tiles. Acrylic artist Scott Taylor demonstrates his technique beginning at 11am, free with admission. 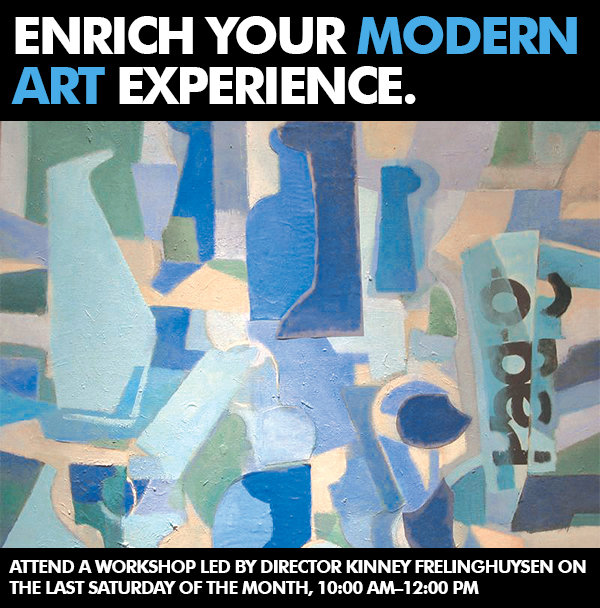 Experience a new technique for looking at modern art, led by Director/Artist Kinney Frelinghuysen in the Studio from 10-noon. Color aid paper and charcoal and sketchbooks provided. 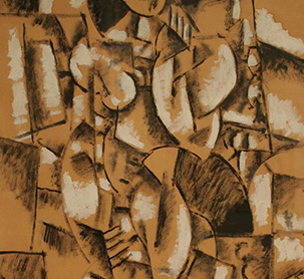 In June, Google will be capturing the galleries of Crystal Bridges Museum of American Art in Bentonville, Arkansas using its Street View technology and has selected Frelinghuysen's Glass and Bottle, 1948, as one of the artworks to be photographed using its ultra high resolution Art Camera. The Google Arts & Culture project has partnered with over 1200 museums all over the world to expand global access to artwork. Crystal Bridges Museum aquired the 30"x40" oil on board painting in 2015. 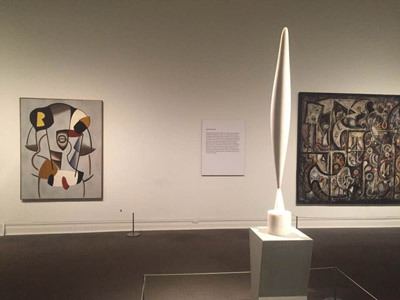 How to Look at Modern Art-A new technique! 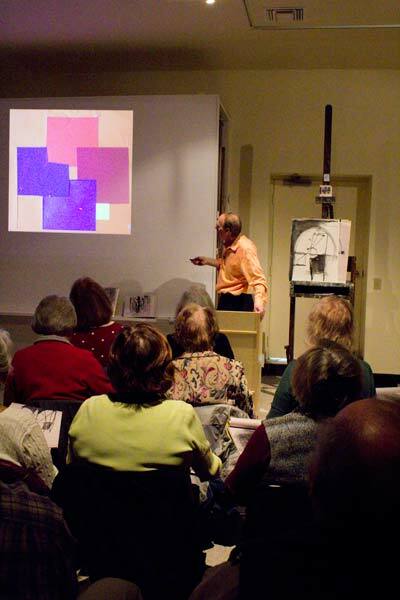 Watch the sold out OLLI adult education class from this spring. Join in with your own sketchpad see how easy and fun it is! Click here for day one. 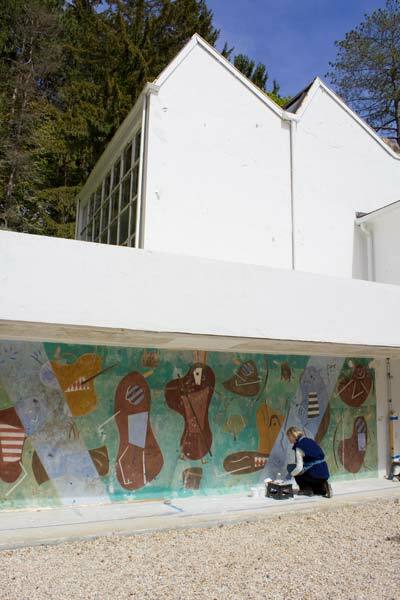 After years of solar radiation, moisture, and the freeze/thaw cycle, the outdoor fresco painted by George L.K. Morris in the 1940's needed to be conserved. Cassie Myers, a conservator specializing in murals, is re-attaching the loose stucco which adheres to the base wall and is "in painting" the losses on the mural surfaces. She is retaining the integrity of the artwork in this painstaking process. 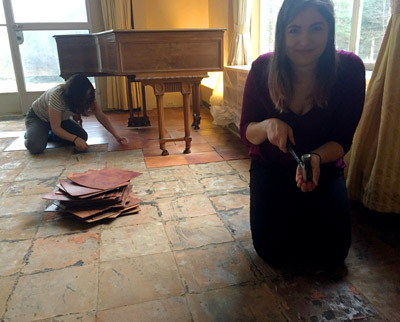 Staff member Rachel joined in to remove the leather floor in the Living Room. We are brainstorming ideas for gift shop items recycled from the orginal floor with local leather artist Michael King. Stay tuned for updates and images of the replacement leather floor. 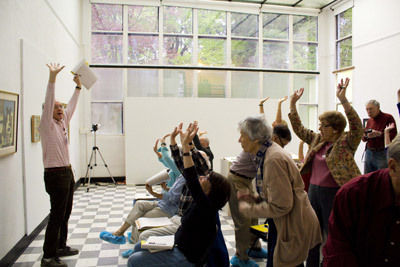 Watch the sold out OLLI adult education class from last spring. Click here to enjoy day two! Watch author Hugh Howard's sold out slide lecture from this summer. Click here for a front row seat! 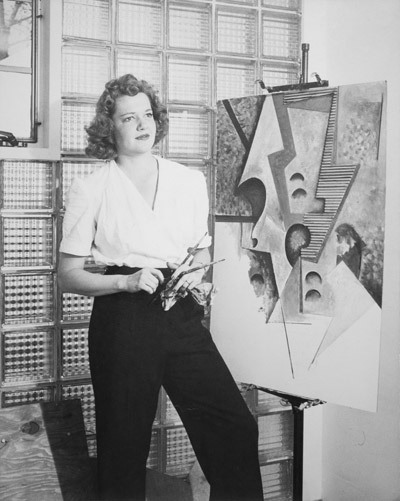 You didn't miss curator, author and archivist Eugene R. Gaddis' slide lecture on the Modernist dynamo Chick Austin. 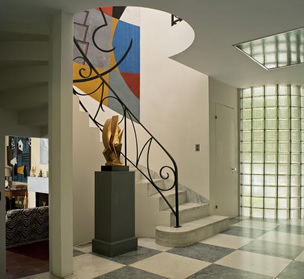 Click here to view the pictures of his idiosyncratic house operated by the Wadsworth Athenaeum in Hartford, Connecticut and hear the story of one of Modernism's unsung heros. 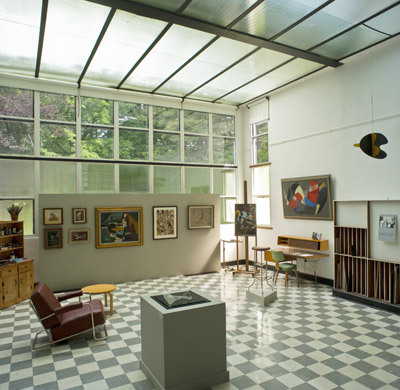 "The airy studio that the artist, writer, and collector George L.K. 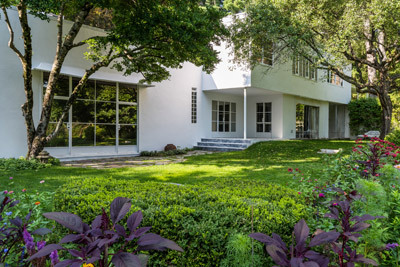 Morris built in 1931 on his family's 46-acre estate in Lenox, Massachusetts, looked nothing like the mansion he grew up in", writes Wendy Goodman for Departures Magazine. Read the full article here. We are open Thursday-Sunday as usual this week and closed on Monday, Labor Day, September 4th. After Labor Day we drop Sundays and are open Thursday-Saturday until Columbus Day. Vintage 1930's travel films, taken by the Berkshires' most creative couple. Click here to read the rest of the fabulous article and slideshow by Hilary Reid. Read Jennifer Huberdeau's article in her weekly series detailing the history of the Berkshire Cottages and how FMH&S came to be. Click here to read the interesting article. 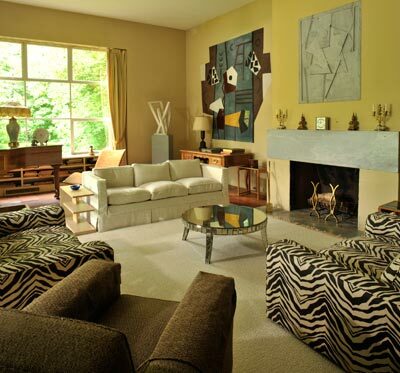 Modern Times--Frelinghuysen Morris House & Studio welcomes art lovers by Kate Abbott and images by Gregory Cherin. Click here to read the rest of the informative and enjoyable article! 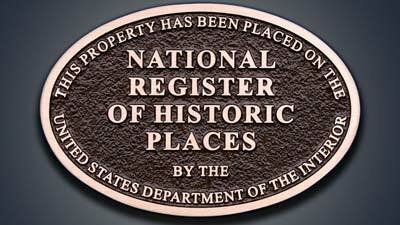 The National Register is the official list of American cultural resources worthy of preservation. All properties, from every state, are evaluated according to uniform standards from the Secretary of the Interior and are determined to contribute to an understanding of the historical and cultural foundations of our nation. Thank you to the professional and thorough surveyors and researchers who worked on our admission. Especially Virginia Adams, who unearthed new historical information! 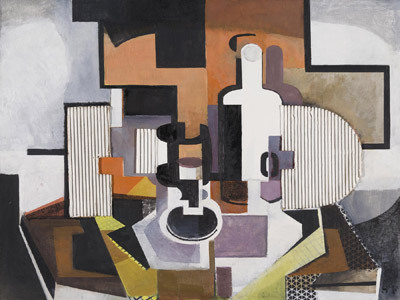 A 1943 oil and collage on Masonite titled "The Ring" was sold by a collector at Bonham's Auction House last week for $56,250, above its $30-50,000 estimate. FMH&S has been awarded a $9570 grant from the National Film Preservation Foundation to preserve part of the 16mm film collection taken by George L.K. 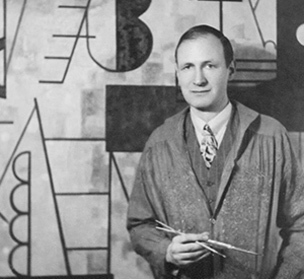 Morris in the 1930's. The Foundation grants target rare films such as silent films and films of sites receiving little media coverage. 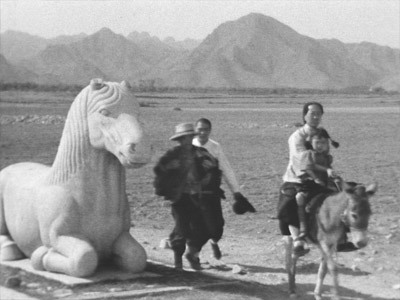 This grant covers 3 films from a Far East 1934 trip by Morris visiting China,Japan,Cambodia, Indonesia and Hawaii capturing historical and culturally valuable sights of colonial, pre-WWII life. 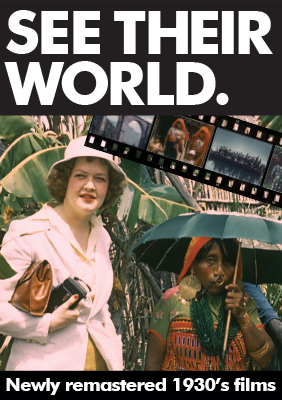 FMH&S has accomplished the goal of digitizing the entire film collection comprising 38,16mm films and the digital copies have been shared with the public in several exhibits over the years titled "See Their World". The grant will enable FMH&S to preserve films deteriorating from vinegar syndrome that were too fragile to digitize and view by creating film-film copies of these three films, the best practice in the industry. Highlights include “See Their World”, short remastered films from the 30's by artist George L.K. 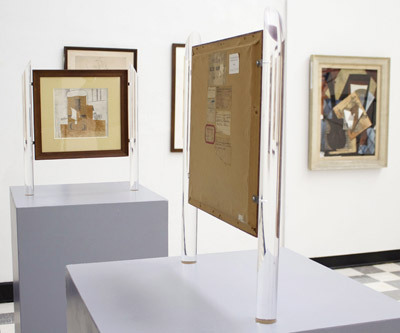 Morris of South and Central America and Switzerland and never before exhibited paintings by both Morris and Frelinghuysen. 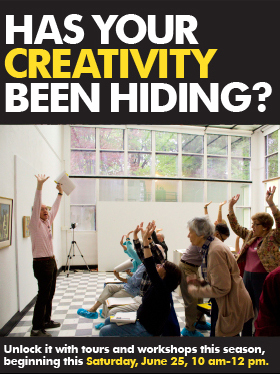 “Has your Creativity Been Hiding”, workshops held on selected Saturday mornings by Director/artist Kinney Frelinghuysen explore how to look at modern art. Mini-workshops available at the end of every tour. June-August, Painting Demonstrations led by professional artists from the community. The artists will create in plein air and discuss their technique Fridays at 11am. Free with admission. Click CONTINUE READING below for specific names, times and dates. Give the gift of membership & Stocking Stuffers! Family membership is only $75 and individual membership $40 allowing you unlimited visits to your favorite oasis in the heart of Lenox. 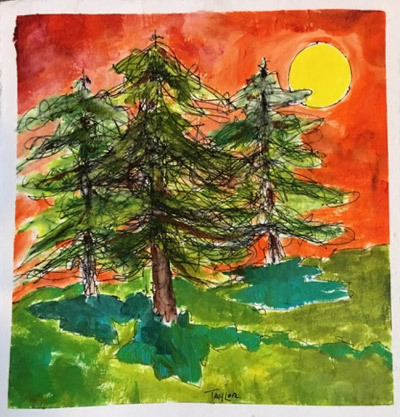 Enjoy the tours, painting demos, workshops, or just the tranquility of the 46 acres of forest trails, flower gardens,and groomed lawns and vistas. 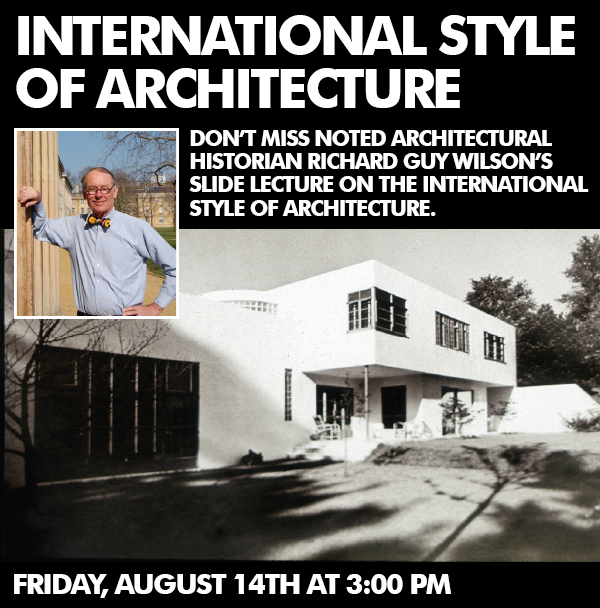 You didn't miss noted architectural historian Richard Guy Wilson's standing room only slide lecture this summer! Click here and enjoy. 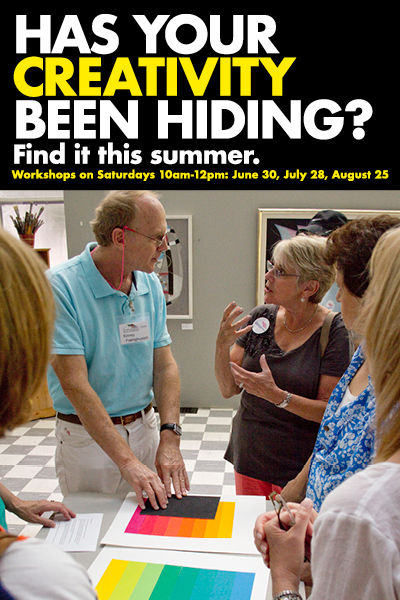 Drop-in Workshop this Saturday, August 29th, 10-12. 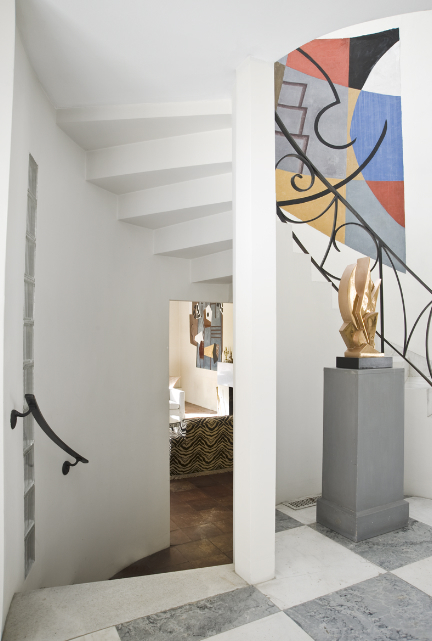 View the article on InCollect.com, a website for collectors. Click here! 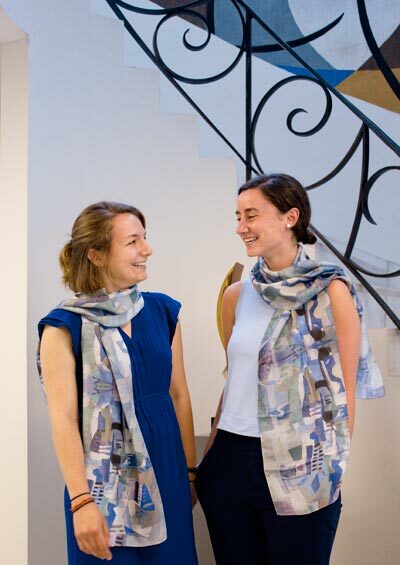 Guides Sarah and Mary Elisabeth model our 100% silk scarves back in stock after selling out! They are designed from a painting in the collection and made in USA. Carole Owens, well-known author of Berkshire Cottages, writes about the "Berkshire Cottage antithesis" in the Berkshire Edge. Click here!